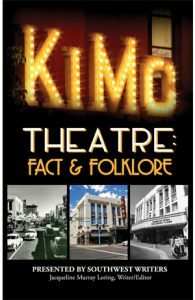 ALBUQUERQUE, NEW MEXICO, April 2019—On May 8th, the City of Albuquerque will sponsor an event at the KiMo Theatre at 6:30 pm to launch KiMo Theatre: Fact & Folklore. The public is invited to attend free of charge. The book launch will include appearances by KiMo Theater performing artists including the Kalpulli Ehecatl Aztec Lead Dancer, the New Mexico Young Actors Guild, the NM Ballet Reparatory and the Watermelon Jug Band. There will also be a silent auction of KiMo memorabilia and other items. The KiMo theatre is a celebrated historic landmark in Albuquerque. KiMo Theatre: Fact & Folklore, presented by SouthWest Writers and writer/editor Jacqueline Murray Loring, is a collection of newly-told stories, articles, memoirs, insights, opinions, never-before-heard remembrances, and researched facts about the KiMo as a performing arts theatre and a movie palace. The collection was written by with a loving, respectful relationship with the theatre. Past employees, elected officials, performers, and audience members share remembrances of the Bachechi family, the theatre’s construction in 1927, the 1977 vote by Albuquerque citizens to buy and preserve the building, the theatre’s closings for renovations, and its murals, art, and (disputed) paranormal activity. Copies of the book will be available for purchase. If you would like more information, please contact ReVaH Loring at (505) 830-6034 or Info@SWWriters.com. SouthWest Writers (SWW) is a nonprofit 501(c)(3) organization, located in Albuquerque, New Mexico, devoted to helping both published and unpublished writers improve their craft and further their careers.